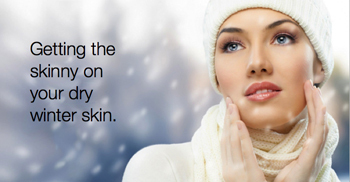 Winter 2014 has been one of the coldest, harshest winters on record, and that can mean bad news for your precious skin. Dry, cracked, chapped? Disastrous! This is no time for your average body lotion. You need to step it up and wrap your skin in the velvety soft, richly moisturizing Water-Free Herbal Body Lotions from Ecco Bella. We've got your whole body covered this winter, and here's why our lotions are different. This may come as a surprise, but water-based formulas are not what your body needs in the driest, harshest season. We're not saying water is bad for your skin, but it's not an ideal base for an effective body lotion. Did you know that although water acts as a plumping, hydrating agent on impact, it actually evaporates quickly, and once that happens your skin's moisture is once again lost? This means you'll have to re-apply often, and will not achieve that long-lasting moisture protection you need. That's why our Herbal Body Lotions are water-free. The creamy, non-greasy moisture gets in and stays in. Because when you need serious moisture, we know that only the most concentrated, hydrating formulas will do. Ecco Bella has skipped the water and instead packed our natural and organic body lotions with rich, luxurious, skin-loving oils and aloe that will pamper your whole body and envelop you in a ribbon of true, silky moisture. Our lotions all have a base of Organic Aloe leaf, which is not only known for its natural UV defense, but is also packed with vitamins that your skin craves year round, and especially in the winter. Ecco Bella Water-Free Herbal Body Lotions are enriched with skin superfoods such as coconut oil and sunflower seed oil, deeply caring for your skin instead of a topical band-aid solution. Ecco Bella Water-Free Herbal Body Lotions are not only super-concentrated and luxurious, they are also offered in a variety of beautiful scents from nature. Each one of our lotions has a unique, beautiful scent that is rich and unforgettable, and for those who prefer no fragrance, we offer our unscented formula. Ecco Bella's lotions are available in four deliciously aromatic scents: Vanilla, Lemon Verbena, Grapefruit and Lavender, all of which possess aromatherapy benefits and are known to impart a youthful glow to the skin. So this winter, when you want to get serious about quenching your parched skin, choose Ecco Bella Water-Free Herbal Body lotions. Yes, the body lotions are vegan and gluten-free! We know it's not just short-term water you're after. You want long-lasting hydration, gorgeous scents and that healthy glow. With Ecco Bella, you can have it all.